She’s the woman of the moment, thanks to the fact the the actress has bagged all the top honours for her powerhouse performance in box office hit, Raazi and Bollywood actress, Alia Bhatt is definitely basking in the glory. But, besides walking away with all the awards, Alia is also slaying with her back to back stylish appearances. While the entire country is talking about her updated wardrobe, Alia just shot a few pictures for a magazine’s April edition and we can’t keep our eyes off her. 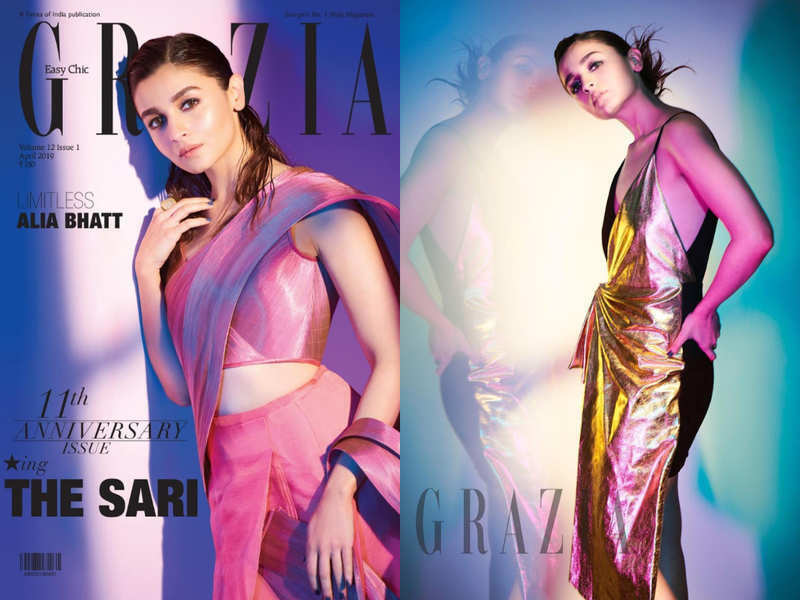 The cover features Alia looking gorgeous in a pink sculpted metallic sari and blouse by Rimzim Dadu. She has finished off the look with a gold and diamond ring from Raniwala 1881. Well, Alia does bring in summer with a metallic bang! The inside scans of the magazine have Alia looking sensational in different avatars. The picture has Alia killing it in a draped leather dress by Gucci. Alia looks stunning in a structured satin blouse by Gaurav Gupta and tailored organza shorts by Gauri & Nainika. Alia slays in a metallic plissé dress with wide belt, both from Amit Aggarwal. Alia’s slick hair are courtesy, Gabriel Georgiou and her on-point make-up is thanks to make-up artist Puneet B Saini. We think the actress is having a fashion moment right now. Tell us what do you think in the comments section below. Alia’s slick hair are, courtesy Gabriel Georgiou and her on-point make-up is thanks to make-up artist Puneet B Saini. Next story Buzz is: Kareena Kapoor Khan to make her Television debut with Zee TV’s Dance India Dance?